Often used in combination with foil stamping, embossing alters the surface of paper stock or other substrates by providing a three-dimensional or raised effect on selected areas. The procedure requires the use of two dies: one that is raised and one that is recessed. The dies fit into each other so that when the paper is pressed between them, the raised die forces the stock into the recessed die and creates the embossed impression. A specific level of pressure is applied to the dies in order to squeeze the fibers of the paper, which results in a permanently raised area in the paper. When the dies are produced, a die maker engraves the desired image into several metal plates, which are the embossing dies for use on an embossing press. A thorough understanding of the process will enable a more successful result. Generally, embossing is the process most often employed to attract attention or convey a high quality textural contrast in relation to the surrounding area of the paper stock. “Debossing” is similar to embossing, but recesses the design rather than raising it. Rather than the paper being raised in specific areas, it is indented. The process involves applying pressure to the front side of a substrate and forcing the material down from the surface. Although it is not as common as embossing, it is occasionally used to provide a different effect or appearance that fits a particular theme. Embossing and debossing on digitally printed applications is an off-line process, which may add a significant cost to the job. Pressure: the intensity of the impact on the weight of the stock being embossed. Heat: the ability to maintain a consistent heat level for the best impression. Die depth: the client's artwork or the engraver's efforts will initially determine the die depth, however, if by looking at the artwork it appears that an adjustment of the die depth may be necessary, the die may need to be retooled to achieve a greater depth. Most types of paper can be embossed, and size is not normally a consideration. 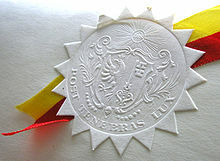 Embossing without ink, so that the image is raised but not colored, is called “blind embossing”. Embossing used in conjunction with ink, so that the raised area is colored, is called “color register embossing”. Embossing used in conjunction with foil stamping is called “combination stamping” or “combo stamping”. A notary public may use an embossed seal to mark legal papers, either in the form of an adhesive seal, or using a clamp-like embossing device, to certify a signature on a document, contract, etc., or cause to become certified through a notary public or bill. Registered professional engineers also use embossing seals to certify drawings, thereby guaranteeing to the recipient that due diligence has been exercised in the design. Government agencies use embossed seals to certify that an important document, such as a birth certificate, court order, etc., is an authentic, original copy, rather than a photocopy that could be altered in the copying process. ^ "Embossed-in-Register Flooring". On The House Media. Retrieved 2014-01-27.